Jim was a master of illusion, animating the inanimate and able to make audiences believe that pigs and frogs can be singers, actors and soul mates. He enjoyed the magicians’ craft and showcased magic master Doug Henning on The Muppet Show. 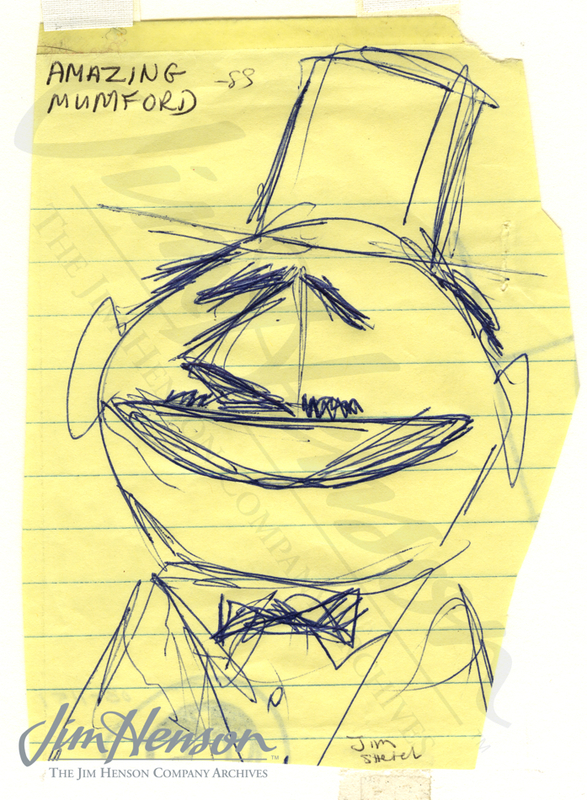 More than a decade prior, Jim had sketched out a bumbling magician character for Sesame Street, The Amazing Mumford, who performer Jerry Nelson brought to life in 1972. In 1974, between television projects, Jim, Frank Oz and ten-year-old Brian Henson headed up to Boston for the annual convention of The Society of American Magicians. Since their founding more than a hundred years ago, the Society has strived to advance, elevate, and preserve magic as a performing art. Their mission of, “promoting an environment for the worldwide magic community that fosters fellowship, preservation of the magical arts, ethical standards, education, and personal growth” would have appealed to Jim. Learn more about the Society of American Magician and their 2013 convention. Jim’s sketch of The Amazing Mumford for Sesame Street, 1972. This entry was posted in 07-July '74, 1974, Appearances and tagged Boston, Brian, Brian Henson, Doug Henning, Frank Oz, Jerry Nelson, Magicians Conference, Sesame Street, The Muppet Show. Bookmark the permalink.